SMSA’s Julia Beebe, left, drives as Coginchaug‘s Raegan Moore defends on Saturday. UNCASVILLE – For the first time in six years, Coginchaug is on top of the mountain in girls’ basketball. 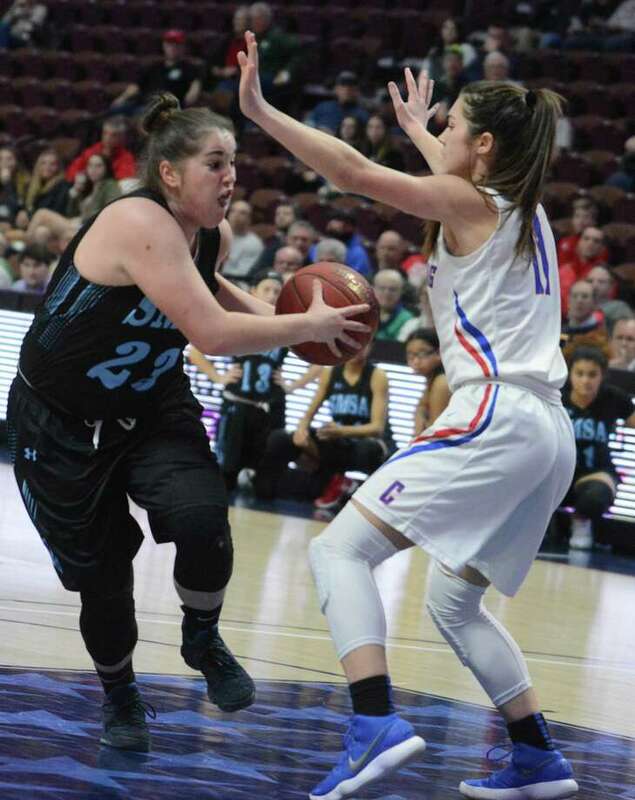 The Blue Devils won their first CIAC Class S state championship since 2012 in dominating fashion Saturday morning, beating Sports and Medical Sciences Academy 71-42 at the Mohegan Sun Arena. Ironically, it was an overtime loss to Cromwell just 22 days ago in the Shoreline Conference final that helped the Blue Devils in their run to the title. The Blue Devils (21-7) raced out to a quick 7-0 lead just two and a half minutes into the game, with Virginia Benbow scoring four of those points. SMSA (18-7) closed it to 19-18 midway through the second quarter thanks to a three-pointer by Kalissa Jameson (16 points). However, Coginchaug went on a 10-0 run to take a 29-18 lead with 37 seconds remaining in the half. Jameson’s bucket just before the buzzer made it 29-20 at the break. The second half was all Coginchaug. The Blue Devils went on a 20-4 run to open the third quarter to break the game wide open. From there, the closest SMSA would get would be 58-39 with 4:35 to go on a free throw by Christina Marcoux. Jessica King, who led all scorers with 25 points, had eight in the fourth quarter as the Blue Devils stretched out their lead with the 29-point margin being its largest edge of the day. Coginchaug had three other players in double figures. Freshman center Jessica Berens had 12 points, Benbow added 11 and Lane 10. Kalissa Jameson 6 6-13 16, Rebecca Mayer 2 1-2 5, Christina Marcoux 5 1-2 9, Julia Beebe 2 2-3 6, Kennedi Joseph 1 1-3 3, Tatiana Stokes 1 0-0 2, Chyna Jones, 0 1-2 1, Rianne Mayer 0 0-2 0, Datari Mathis 0 0-2 0. Totals 18 11-26 42. Carly Lane 4 2-6 10, Raegan Moore 0 2-3 2, Jessica Berens 5 2-3 12, Virginia Benbow 4 4-5 11, Jessica King 11 5-5 25, Molly Shields 2 0-2 4, Taylor McDermott 1 0-0 2, Lindsey Marino 2 0-0 3, Shannon Carey 1 0-0 2. Totals 30 15-25 71. 3-point field goals: SMSA (Jameson 2, Marcoux 2, Joseph). Coginchaug (Benbow, King 2, Marino).